Mark Cooper was determined to be the manager celebrating after play-off final - Forest Green Rovers Mad! 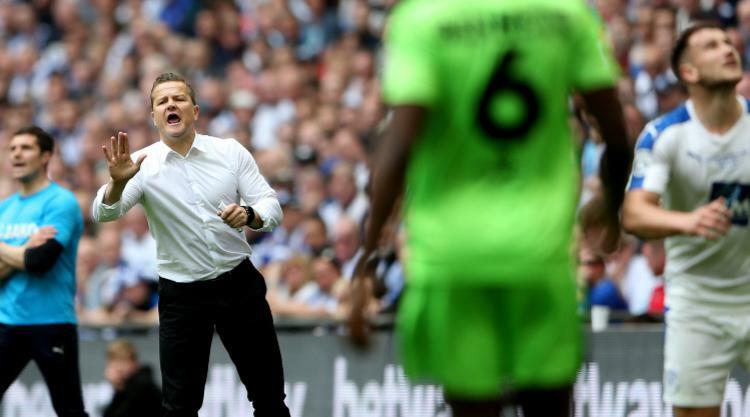 Forest Green manager Mark Cooper was left with very different emotions to last year after his side defeated Tranmere 3-1 in the National League play-off final at Wembley. Cooper had just taken charge when Forest Green fell at the final hurdle against Grimsby last season, but he can now prepare for the Nailsworth-based club's first season in the Football League in their 128-year history. Cooper said: "Obviously I only had a bit-part last year and I just said to Paul Hurst that I didn't want to watch another manager celebrating. "I thought we were brilliant today. The young players were very mature and we looked a really good side. "We'll celebrate tonight - the chairman will have a couple of beers, I'm sure, and full credit to him. "It's an unbelievable achievement to put a village team in the Football League. "When you're on the outside, you think everybody is earning 10 grand a week, but when you get on the inside you realise that's not strictly true. "We have to pay, sometimes, a little bit more to players because of where we are. "We have a competitive budget but that doesn't guarantee anything. "I want to enjoy tonight and I want to savour it and full credit to the players today, they were magnificent." Forest Green went ahead after 11 minutes when Kaiyne Woolery found the bottom corner from 25 yards but his opener was cancelled out by a screamer from Connor Jennings. The lead was restored four minutes before half-time when Christian Doidge ran at Steve McNulty before crashing a magnificent drive into the net. Three minutes later, Woolery stole the ball from Liam Ridehalgh before finishing calmly to grab his second and Forest Green were able to close the game out in the second half. Tranmere manager Micky Mellon said: "Some of the goals we gave away we're obviously very disappointed about. "When you come to a place like this, you've got to do better than what we did in them moments and we made it very difficult for ourselves. "The third goal was a killer goal - another mistake, really, but on the day I totally believe the better team won. "We have to take our medicine for that and every credit to Forest Green. "I think there are things that you have to do well at places like this and they did that today. "We were at one each then we missed the one-v-one with their 'keeper and that was another big moment in the game then we had maybe a half-chance at the back stick when the ball went across. "We weren't able to take our chances and if you're going to be successful here, you've got to take them."